2008 has been a good year for Beachwood Sparks’ old record label Sub Pop so far. They have been getting a lot of attention for releasing debut albums by great young bands like No Age and Fleet Foxes. At the same time they have put some effort into the moulding of their heritage by re-releasing Superfuzz Bigmuff by Mudhoney (in a deluxe edition version) and celebrating their 20 year anniversary with a Beachwood Sparks reunion and 3-day popfest! One band who seem to have been lost a bit in this indie rock shuffle is the Australian psych-orchestra The Ruby Suns who dropped their sophomore album Sea Lion (first one on Sub Pop) in January. 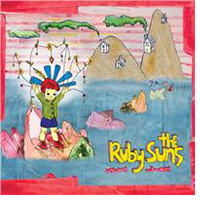 The Ruby Suns are an awesome band with a knack for creating neat pop melodies in a groovy, modern psychedelic format. Their new album is a big step forward for the group and really shows that they have the potential to produce musical masterworks in the future. The Ruby Suns have a rare combination of an open mind and focused concept which (in my mind) are downright crucial components when you attempt to make eclectic albums like Spirit Stereo Frequency by All Night Radio or Pavements Crooked Rain, Crooked Rain. Iâ€™m not saying that Sea Lion is an album of the same importance and magnitude as those mentioned above but you can detect seeds of possibilities which bring hope of great things to come. The music on Sea Lion varies a lot. On a song like There Are Birds The Ruby Suns seem to be a classic indie pop/rock band but on some songs they expand music towards afro pop rhythm much in the same style as media hype Vampire Weekend but with a lot more sonic depth. Tane Mahuta is almost an afro folk song with a lot of psychedelia sprinkled over it. The stand out track for me on the album is cleverly titled Kenya Dig It?. The melody and structure of that song kind of reminds of American multi-instrumentalist Andrew Bird in which it seems simple yet sophisticated at the same time. In conclusion you can say that this album is the break out performance by promising band The Ruby Suns and even though some stuff in their music might need some polishing there is certainly sparks which bare witness of future masterworks.